Hi Running with Tongs readers! I’m Brittany Mullins, a full-time online marketing gal, holistic health coach living in Richmond, Virginia. I’m also the author of Eating Bird Food, a healthy living blog that features nutritious (and tasty) recipes, workouts and a glimpse into my daily life, which is currently being taken over by wedding planning. I’m excited to be guest posting for Lindsay while she’s pampering her new little bundle of joy. This is actually my second time guest posting here on Running with Tongs. Last time I shared my kale and brown rice bowls and they went over quite well so I figured I would share another vegan favorite – my raw broccoli raisin salad. This broccoli salad is much healthier than the one I grew up eating, which was loaded with mayo, sugar and bacon. It’s still crunchy, rich in flavor and sweet but with much healthier ingredients like raw nuts, seeds and raisins. I even managed to sneak uber-healthy apple cider vinegar into the dressing! 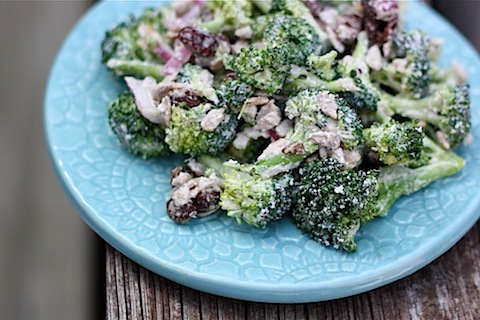 Mix together broccoli, raisins, red onion, raisins, and sunflower seeds. Top with dressing and combine until all ingredients are covered. 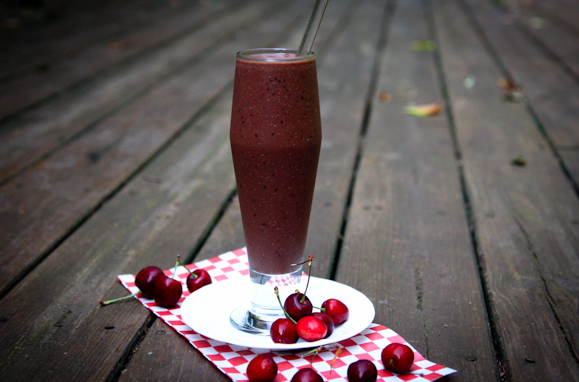 Combine all ingredients in a high powered blender or processor until completely smooth. Thank you Lindsay for allowing me to guest post! I hope you all enjoy this salad as much as I do. This is a guest post from Erin at Creative Soul in Motion. Erin is a yoga-loving, whole-food eating Warrior Goddess empowering people of all ages to find growth + happiness through active living. 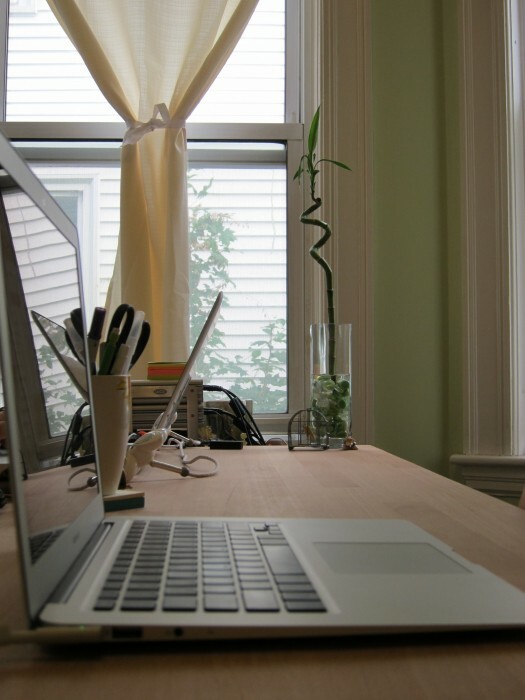 For most of us, our jobs require us to sit in front of a computer typing away all day. 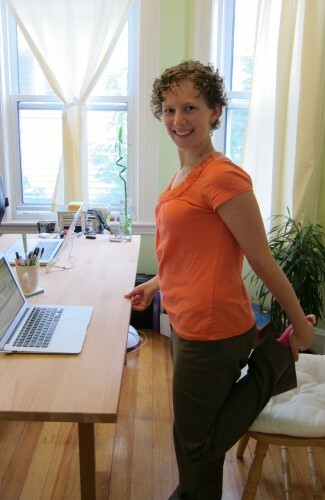 There’s no movement, no spontaneity, no openness in our work days and instead our bodies are wound up and stressed out. For many, work causes stress not only to the mind but to the body and the spirit, which is one reason why taking your yoga practice off of the mat and to your desk chair can be so rewarding and uplifting. The foundation of yoga – connecting breath and movement – can help you de-stress, unwind and open up even during the most stressful days. So here are 7 simple yoga moves that you can do at the office, next to your desk and without much fanfare. Move through this at your own pace. These poses can help you wake up your body, wring out tension, bring fresh oxygen into your body and organs, alleviate tightness and generate new energy! This will help you line up your body from your toes to your head. First, step away from your desk and ground your feet into the floor creating a connection between you and the Earth. Inhale your shoulders up and back and roll your neck. Take a deep breath as you let your shoulders slide down your back and your hands gently shake out next to your sides. Take 3 more deep breaths. 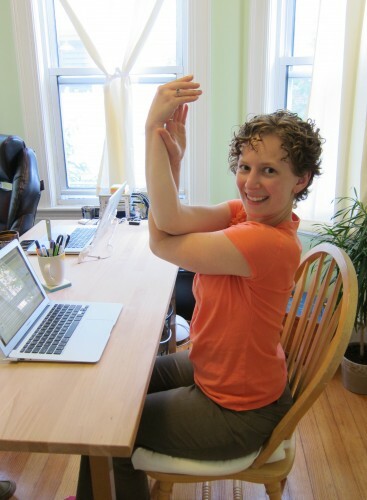 Inhale your arms out to the side palms up, exhale and bring your right arm up top crossing your elbows. Inhale and bring the backs of the arms together bringing your arms up and shoulders down. Breathe into your upper back and exhale your arms back to your sides. Repeat with your left arm on the top. 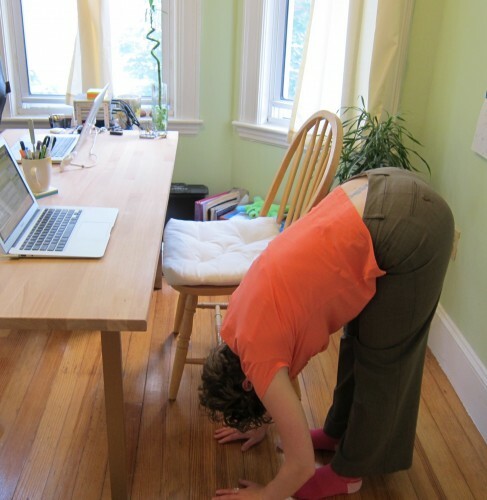 Hold the desk in front of you with your left hand and press your feet into the floor. Lift your right foot and hold your right foot while pulling your abdomen in. Inhale and gently guide your right heel and your right knee towards the floor. Try to keep your knees close together. To take this a bit farther float your left hand up towards the sky and stretch your fingers towards the sun. Ground your feet firmly into the floor, take a deep breath in and let your arms float above you. Bring your hands together and allow yourself to fold over at your hips slowly moving your hands down your body and onto the floor in front of you. Inhale and lengthen your body to stretch out your spine and then fold forward. Just let go of everything and breathe deeply. If you can’t touch the floor simply let your hands fall towards the floor and maybe hold opposite elbows and sway a bit. Sit towards the front of your chair with your feet firmly planted on the ground and your knees at a 90 degree angle. Have your spine long and your shoulders soft. Inhale as you puff your chest out and roll your shoulders down and away from your ears. Exhale pull your stomach in and let your shoulders roll forward and your head drop down. Repeat at least 5 times moving slowly with your breath. This short and simple series re-connects you with your breath, your core and your body. It helps awaken your senses, open your mind and lets your stress just melt away. It brings you back to the present and renews your energy and focus. Try doing this everyday around 2 PM and I bet you’ll notice your days don’t feel as frantic and overwhelming. Just a few minutes of yoga is all it takes to connect and find clarity. 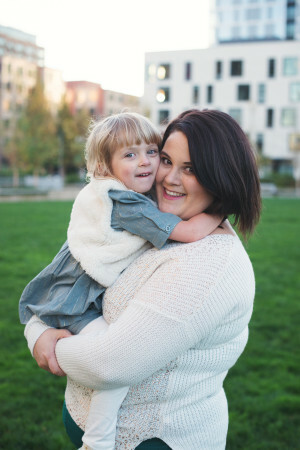 You can read more about Erin’s journey towards balance, joy and connection at Creative Soul in Motion. It is often considered challenging to cook a healthy and tasty vegan recipe. But, with a little innovation and experimentation, one can churn out interesting, wholesome recipes like this one. 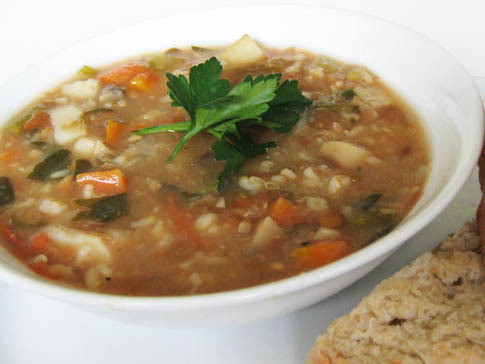 The lentils give a huge burst of protein and the veggies provide the minerals and vitamins. The rice in the recipe provides the carbohydrates. Thus, this is a balanced, one-dish meal. Eat it as a soup or a small meal. It is very simple to prepare if you have all ingredients at hand. You can use any veggies of your choice or what is there in your house. Wash the lentils and the rice well and soak for 15 minutes. Add oil in a pan or pressure cooker. Add the cumin seeds. Once they sputter, add in the chopped garlic and onion and fry till transparent which should take around 2-3 minutes. Now add the tomatoes and fry for another couple of minutes. Add the lentils and the rice along with the stock. Cover and cook till the lentils and rice are cooked. If you use a pressure cooker, you can cook faster. That is what I normally do. But, you can cook on the stovetop as well. Orange lentils cook faster, and soaking expedites the cooking time. Now add in the vegetables and salt with all the other seasonings. Add more water if necessary. Simmer for 5 more minutes. Taste and adjust seasoning. Turn off the heat and add the lime juice. Garnish with chopped cilantro leaves and serve hot. I like my soup a little thin, but you can have it thick and chunky as per your preference. Your tasty soup is ready. Enjoy with your family. Rachna Parmar, an ardent blogger, enthusiastic cook and mom of two, is an editor at Livesnet.com, a site offering tips on baby safety products and parenting skills. Please visit Livesnet and read her wonderful articles on top rated food processors and best juicers to buy. While I prep for the arrival of our baby I have invited Mellissa from A Fit and Spicy Life to share one of her recipes. 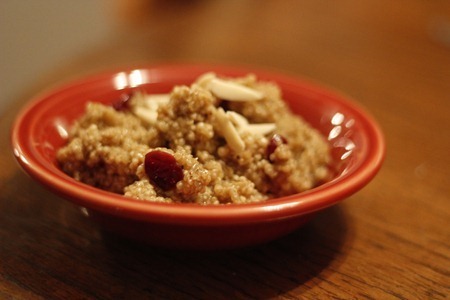 Place quinoa in large saucepan; add enough salted water to cover quinoa by 1 inch. Bring to boil. Reduce heat to medium-low; cover and simmer until quinoa is tender, 15 to 16 minutes. Drain. Chill until cool. 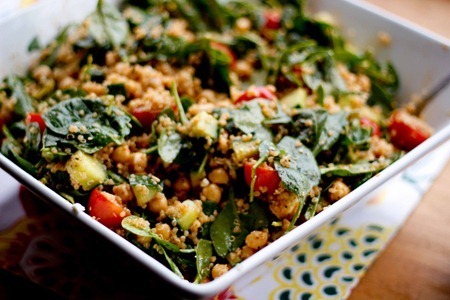 Combine spinach leaves, garbanzos, cubed cucumber, halved tomatoes and mint leaves in extra-large bowl. Add cooled quinoa and toss gently to blend. Whisk vinegar and smoked paprika in small bowl. Gradually whisk in oil. Season dressing with salt and pepper. Hi! I’m Nicole from Making Good Choices and I’m so happy to be here with you while Lindsay spends time with her little one. I’m a small business owner and health counselor (like Lindsay) so I spend my days working at Pure Bliss Eats (www.pureblisseats.com) and helping people live a healthier life. You can read more about my business here. I am (as of when I wrote this) 25 weeks pregnant. I’ve enjoyed following along with Lindsay’s pregnancy and keeping track of her experience. It’s so much fun finding pregnant bloggers, especially since I don’t have too many IRL friends who have babies/have been pregnant. 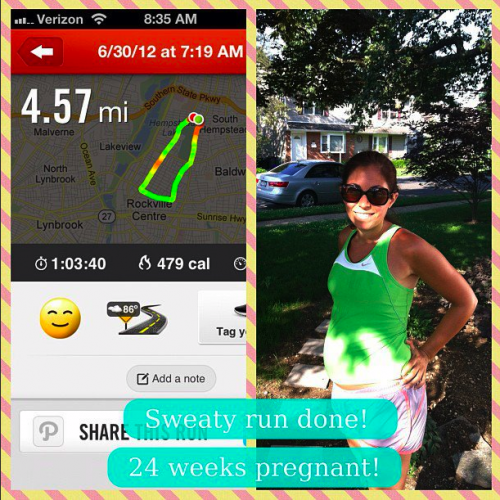 Ever since I got pregnant I have been running anywhere from 9- 15 miles a week. Generally I run about 12. When I found out I was pregnant, I wasn’t sure about a lot of things, but running wasn’t one of them. I just figured I’d keep running until I couldn’t anymore. So far, so good. Now, let me tell you some days are WAY harder than others. Some days it takes my body 2 miles just to warm up and feel normal running. Those are the days where I stop and start and take lots of walking breaks. I try hard to just be super happy I’m running instead of discouraged I need to stop and start so much. 99% of the time I’m in a positive mindset. 1% of the time I need to get over myself and keep going. I have been running for years. Sometimes longer distances, sometimes shorter. Before I got pregnant I was running up to 6 miles at a time. 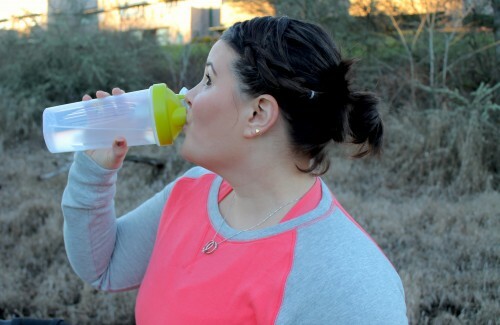 I was physically fit before getting pregnant, which is why I kept up exercising and running. I wanted to share some tips that have worked for me over the past 6 months to keep me happy while running. Getting out and exercising: In the first tri when I felt awful I would get up to workout and it was the only thing that made me feel better. I took it easy most days, but just getting the heart pumping and blood flowing really helped. If I ever had felt worse I would have stopped. Allow yourself to walk whenever you want. As long as I’m getting out there, I could walk 1 time or 4, I don’t really care. Don’t worry about pace. Some people (like Michele) are still super fast. Before getting pregnant I ran about 9:30-10 minute miles when I was just out for a typical run. Now I’m running between 11-12 minute miles and celebrating every one. Hydrate and go to the bathroom about 10 times before you run. Or better yet, go running FIRST thing when you wake up. I’ve found that if I just wake up and go I am MUCH happier and don’t feel like I have to go to the bathroom ½ mile in. I try to make sure I’m drinking enough water, but I don’t want to drink too much before I run because then I’ll have to go to the bathroom 5 minutes in. Carry a cell phone and water if you think you’ll need it. I ALWAYS carry my cell phone while running. You never know if you just can’t finish the run, or if you need to picked up. Listen to your body. If you feel pain or are very uncomfortable, stop. Whatever you thought about running before, throw it out the window. It’s important to be FLEXIBLE and to do what you’re body needs. If you need to stop and start or take a break do it. The important part is that you are getting out there and moving. Have fun! This isn’t a time to be super serious about your running. Enjoy the fact you are running! Note: I spoke to my doctor about the fact that I run and he said that as long as I was doing it before, I was fine to continue. Speak to your doctor before you do anything! 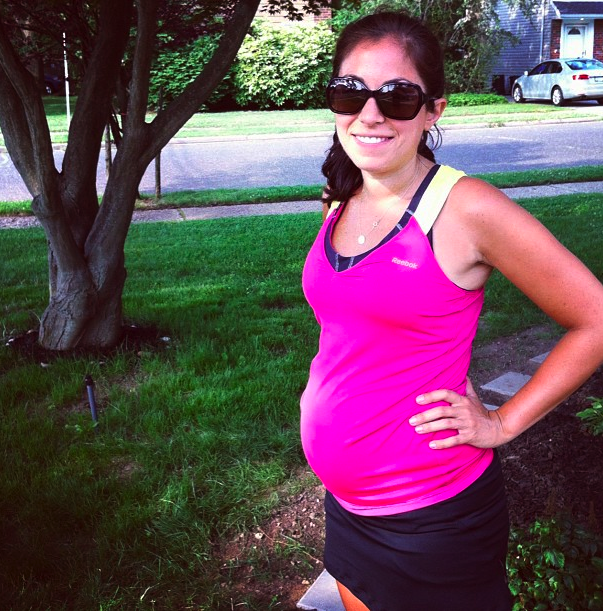 Thank you for letting me share my running while pregnant experience with you! I hope you’ll visit my blog as I talk about food, fitness, health and being pregnant!